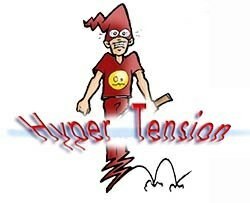 Hypertension has a way of creeping up on you without warning. You may be young or old, male or female, adult or child. You may not even know what hypertension means. Maybe you've heard it referred to as high blood pressure. Whatever the case, it's important that you know that anyone can have it. Hypertension can be a serious condition with few symptoms, but it can be treated and controlled. If you have high blood pressure and allow it to go untreated, you run an increased risk of developing heart disease, stroke, and kidney disease. But if you listen to your doctor and actively follow the treatment plan outlined by him or her, you may reduce those risks and enjoy a healthy, energetic lifestyle. Every moment of every day your heart works hard to pump blood throughout your entire body. As the blood is pumped, it exerts pressure on the inner walls of the blood vessels. Hypertension occurs when the pressure remains abnormally high for a long time, putting a strain on the arteries and the heart. In most cases, we simply don't know what causes this increase in pressure. Doctors call this essential hypertension. Occasionally, a person may experience secondary hypertension. This is when we do know the specific cause, such as kidney or hormonal fluctuation. If the arteries constrict and force the heart to work harder, the high blood pressure will eventually increase the size of your heart. This elevation in blood pressure can result in heart disease, stroke, or a heart attack. It can also increase your risk of kidney failure or eye problems. Hypertension can affect anyone, but your chances may be increased if you fall into certain high-risk groups. This may be especially true if you have at least one other family member with hypertension. High-risk categories include people who tend to be ""salt-sensitive"" and retain excess sodium in their blood, people who are overweight and people faced with constant stress, particularly job-related. Adults over 60 years of age, diabetics, and African-Americans also run an increased risk of developing hypertension. The only way to check for hypertension is to have your blood pressure taken. It's fast, it's painless and it could save your life. Your doctor will wrap an inflatable cuff around your upper arm, pump it up, and then use a stethoscope to listen for the sounds of blood being pumped by your heart. When your heart beats, the pressure it exerts is called systolic pressure. When your heart is resting between beats, the amount of pressure being measured is called diastolic pressure. While listening to these sounds through the stethoscope, your doctor can get an accurate reading of both pressures. Normal blood pressure is considered to be 120/80. The first number represents the systolic pressure; the second number is the diastolic pressure. These numbers can vary from person to person and may read differently on any given day. But if your systolic pressure registers over 140 or if the diastolic pressure is over 90 on repeated checkups, you have high blood pressure. It is important to know that hypertension generally is not diagnosed on the basis of a single measurement. In fact, your doctor may measure your blood pressure several times before reaching a conclusion. Between visits to our doctor, you may wish to check your own blood pressure. Many pharmacies now offer this as a complimentary service or you may decide to invest in our own blood pressure cuff. Frequent check will allow you to be on the alert for repeatedly high readings and to share this information with your doctor. Cholesterol can also be a problem when it comes to high blood pressure. This wax-like combination of fat and protein in your blood stream is good in small amounts. But when the levels of a particular type of cholesterol become too high, your blood vessels may become clogged and weakened. If this cholesterol builds up over time, it can reduce the flow of blood and force your heart to pump harder, elevating your blood pressure. This condition is called arteriosclerosis. Cholesterol levels should be checked regularly. With a simple blood test, your doctor can determine your cholesterol level. Eating a properly balanced diet - low in fat and high in fiber - can help lower your cholesterol. If you are more than 20 pounds over your ideal weight, reduce your daily calories and begin increasing your exercise. Walking, jogging, bicycling, swimming, dancing, tennis and aerobics are excellent activities. Before starting any exercise program, you should talk to your doctor. For some people with blood pressure problems, reducing salt in the diet can have an immediate effect. Some salt - about 1/4 teaspoon daily - is necessary for normal body functions. But the average American consumes as many as 3 to 4 teaspoons daily. Don't add salt to your food and use a limited amount in preparation. You can use herbs and spices in place of salt. Avoid these highly salted foods: chips, pickled foods, highly processed foods like cheese and cheese products, luncheon meats, bacon, ham, canned soups, and condiments such as ketchup, mustard, and soy sauce. This article is reproduced from Partner's Magazine with the permission of AIM International. Addresses cardiovascular concerns. This unique product combines coenzyme Q10 with fish oil and tocotrienols.